My writing days, which is every day, are spent at my desk, sharing the real estate with my two cats, Clara and Sadie, who turn 3 in October. Either they’ve become especially interested in my writing, blogging or tweeting, or they like the warmth of my desk lamp. I do know they like to follow the screen cursor around, their heads mirroring its movement as I click here and there, tapping the screen every so often with a paw. They are an important part of my writing life. They sit/sleep on my lap on cold days and keep me warm. They rest their paws on my laptop’s trackpad or the keyboard. One even printed a document by mistake once. Their typing skills are atrocious. I could never let them write for Girls Sent Away. 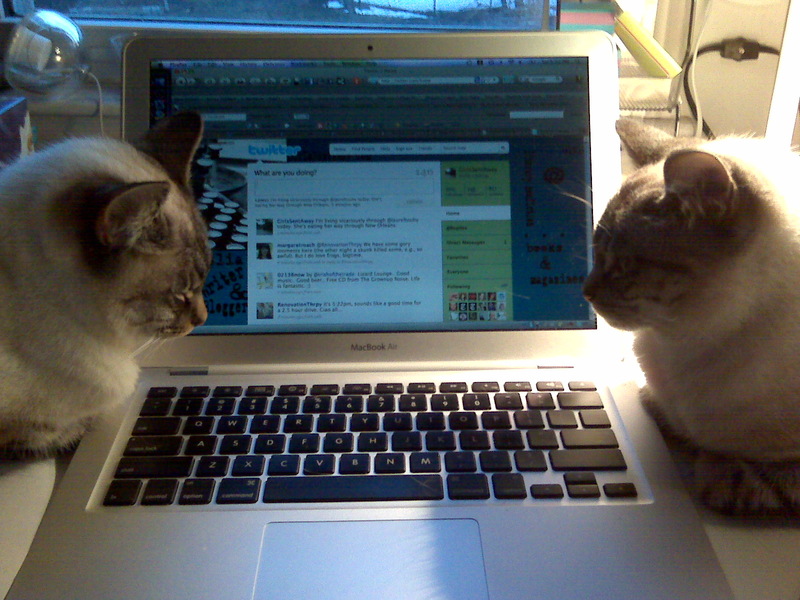 Being part Siamese, they talk to me a lot while I write. Little do they know how many cats have Twitter accounts. Check out the fun site World Wide Whiskers, for news on cats around the world. You can follow the blogger’s cat on Twitter, too.